It's Friday! That means the weekend is almost here again...and I know you guys are excited! But before you indulge into whatever weekend activities you're planning, check out what I have for you today! I'm pretty sure that just like the thoughts of the weekend, this will excite you too...and will definitely give you delight! Hi there foodies! I’m thrilled be able to guest post for Tina today. If you don’t know who I am, or that is because I am still new in the whole food blogging era, I’m Joanna, the blog owner of Chic & Gorgeous Treats. By day, I am an IT consultant and by night or mostly weekends, I pretend to be a patisserie chef, and I suspect this could be my alter ego too. What do I have installed for you today? This is quite a mouth full. I baked one of Tina’s favorite cake but with my own spin to it. 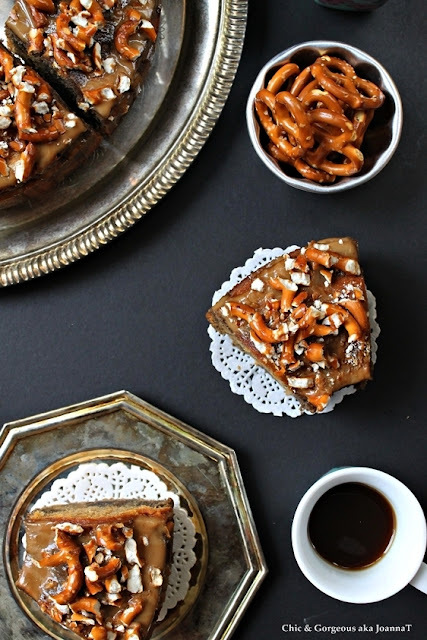 It’s DULCE DE LECHE & COFFEE CAKE with CARAMEL LATTE GLAZE. These flavor combination is truly inspired by one of my favorite caffeine drink, Iced Caramel Latte. If you’re curious, and wondering what is the difference between Dulce De Leche and Caramel? Apart from the color and taste, they are both rich amber brown and sweet. Dulce De Leche, a Portuguese version is made from sweetened milk (in this case condensed milk), where it’s either baked in an oven, using the bain marie method or cook in a double boiler until the sugar caramelizes. In my opinion, I think it’s much easier to make compared to Caramel which I believe is the English version. Caramel requires you to cook sugar and water together until its golden brown in color over low heat without letting the sugar burn, and lastly adding the cream to the caramelized sugar to transform it into a caramel. All it takes is 1 second of your attention away from the sauce pan and you will end up having burnt sugar. It sure has happen to me a number of times. 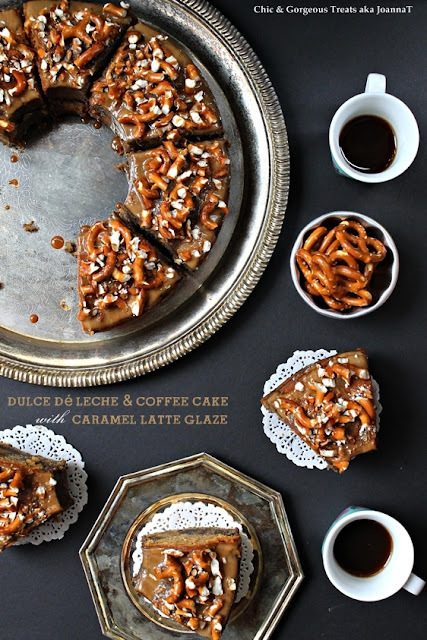 While I might steer away slightly from the original Dulce De Leche Cake; I assure you this DULCE DE LECHE & COFFEE CAKE with CARAMEL LATTE GLAZE pound cake is just as good. Maybe double or triple the goodness. Let me break it down for you. It has 2 flavors in a cake dulce de leche and espresso. I was really inspired by my favorite caffeine drink Iced Caramel Latte; and just knew that the coffee would help tone the sweetness level of dulce de leche and also adding that extra aroma and richness to the overall pound cake. The smell of your kitchen will be heavenly when it's freshly baked out of the oven. To emulate some classic steps of Dulce de Leche cake, I made my own Caramel Latte Glaze, with something extra too "Bailey's Irish Cream" to drizzle over the cake. To finish off, I topped off with heaps of crushed Snyder's Salted Pretzels. Have a wonderful weekend and hope you enjoy this post as much I enjoyed baking this cake for you. Do pop over and give me a holler! 1. Preheat oven to (320F)160°C, and grease and sprinkle some flour over the bundt pan. In a mixing bowl on medium low speed beat melted butter, caster sugar, eggs, pure vanilla extract and sour cream until well combined. Sift flour and baking powder together and add to the wet mixture in 2 batches beating on after each addition until well combined. Separate cake batter into 2 bowls. Fold in dulce de leche into first bowl. For coffee cake, prepare coffee by mixing espresso powder, cocoa powder sugar, essence and hot water together. Add coffee mixture into the second bowl. Beat for another 2 minutes until flour and wet mixture has fully combined. 2. Using an ice-cream scoop, scoop dulce de leche cake batter into another bowl then followed by coffee cake batter overlapping one another. Repeat the process until there’s no cake batter left. With your spatula, gently stir the mixture slightly to help create some swirls. Pour cake mixture into prepared pan and bake between 35-40 minutes or until skewer inserted comes out clean. Transfer onto cooling rack. Let cake cool slightly before removing cake out of the tin. 3. To prepare the caramel latte glaze; in a medium saucepan over low heat, mix together milk, flour, sugar and coffee. Lightly whisk to help flour blend into the milk and coffee. Let it continue to simmer over low heat until glaze thickens coating the back of the wooden spoon. Turn off heat, stir in dulce de leche and Bailey’s Irish Cream, and continue to mix until well combined. Strain glaze over sift to remove any lumps. *NO powdered sugar is required here. If you like it to be sweeter, adjustby adding more dulce de leche 1/2 tablespoon at a time. 4. To serve, using your cake tester, poke some holes on the cake. Place cake on cooling rack over tray. Drizzle caramel latte glaze over the cake letting some drizzle down the side. This additional step is completely optional. Mix extra dulce de leche with some milk to help lighten the caramel glaze. Drizzle extra caramel glaze over caramel latte glaze and sprinkle the top with Snyder’s mini salted pretzels for that extra crunch and flavour. What a superb cake indeed! Thanks again Jo for sharing your recipe here on PiTCC! To all of you out there who haven't been to Jo's website, do check it out! Chic & Gorgeous Treats features the best baked treats you could ever imagine. I'm sure, you'll love it there! For more updates, you can also connect with Jo via Twitter, Pinterest and Facebook. Looks delicious coffee cake Tina and Jo. Love it. Gosh, you are right. I am over excited with this cake, its so so beautiful and thumbs ups to Jo. Not for me to try out because I don't think I have the skills for baking such a great cake. Oh Tina, what a wonderful guest post from such a beautiful and warm blogger. I love Jo, she is such a cutie and yes she makes my mouth water with her baked goodies. Now I have to say that I love coffee and I love dulce de leche...What a genius idea combining two in one. I only wish that I could bake a cake like that! Ladies wishing you wonderful weekend! Great guest post,cake is georgeous,so pretty. The pleasure is mine, Jo! I didn't just enjoy the cake you made...I loved it, and I can't wait to try it myself! Once again, thank you so much for gracing PiTCC with your amazing Dulce De Leche and Coffee Cake! Glad to have such an awesome foodie friend like you! Jo- love this way too much. Looks so tasty. Tina- thanks for having the talented Jo guest for you. Oh this cake looks just royal! So beautiful and delicious! Yes, I'm definitely drooling over this cake!!! It looks super delicious! Thanks for introducing me to Joanna! Headed over to her blog! Great post! Jo makes the most beautiful and marvelous desserts...and this cake is definitely one of them! Thanks, Tina, for featuring one of our mutual friends...what a wonderful recipe! This is a gorgeous coffee cake by Joanne. Thanks for introducing us to a wonderful blogger. Such a fabulous guest post from two amazing food bloggers! Love the spin on it from Jo...so divine, and droolworthy! 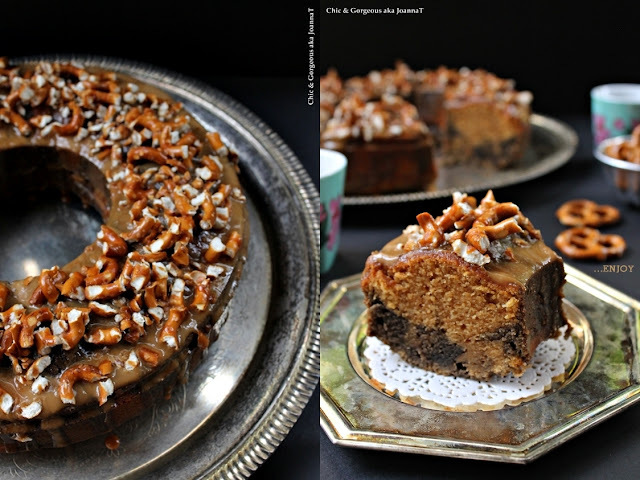 Coffee cake looks very moist and delicious! Thanks everyone for warmly welcoming Jo! She really did a good job on this cake just like with the rest of her creations!